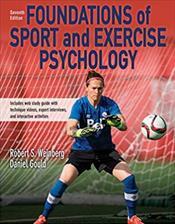 The leading textbook in sport and exercise psychology is back in a revised seventh edition, and it again raises the bar with its engaging introduction to the field. Foundations of Sport and Exercise Psychology, Seventh Edition With Web Study Guide, offers both students and new practitioners a comprehensive view of sport and exercise psychology, drawing connections between research and practice and capturing the excitement of the world of sport and exercise. ...Internationally respected authors Robert Weinberg and Daniel Gould continue to gather and incorporate feedback from teachers and students with each edition, building a text that addresses emerging trends and remains relevant and up to date. In-depth learning aids have been refreshed, including chapter objectives and summaries, sidebars, key terms, key points, and discussion questions to help students think more critically about applying the material.